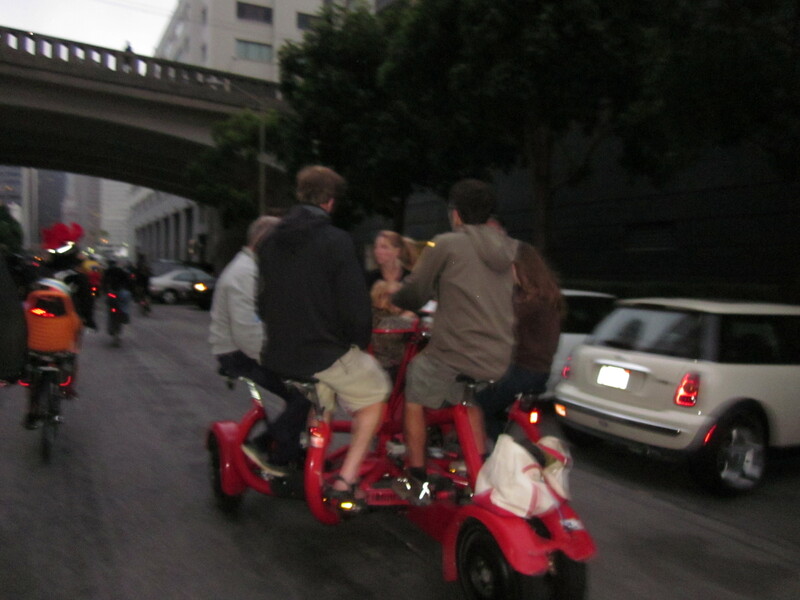 Getting to Critical Mass involved some serious traffic maneuvering. This bus was stopped completely, so we had to squeeze between it and the curb. And that is why I like narrow bikes. It was a busy weekend for our bikes. 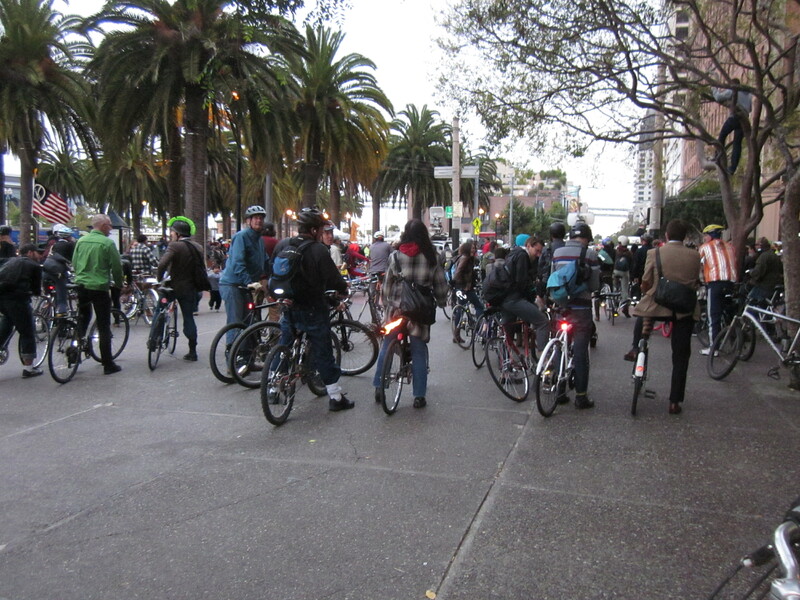 On Friday, we attended San Francisco’s first Kidical Mass, which was an auxiliary of the 20th anniversary Critical Mass. We don’t live anywhere near the Financial District where the ride starts, plus we have little kids and almost never go out on Friday nights. As a result it had been years since we had any exposure to Critical Mass whatsoever, and we’d never ridden in one. To make things more complicated, Matt had rented a car for a work meeting in the South Bay in the morning, had left late, and was caught in traffic returning to the city. He didn’t make it home until 40 minutes after we were supposed to leave. It is fair to say that his delay caused a modicum of tension in in the Hum household. If I had had the new cargo bike already, I would have taken both kids myself, but I had no way of doing that with our current bikes and I couldn’t take one kid and leave one home either. The list of things we could do if we had the new bike has reached the point where I now wonder a couple of times a week if waiting until October in exchange for free delivery was my best decision ever. This woman had both a kid on the back and a dog in front! So anyway, we got there late. Luckily for us, the ride started late too. Although many families had apparently left, pleading bedtimes, there were still a few people there with kids, and it was wonderful to meet them. I was particularly enamored of the family with stuffed animals zip tied to their helmets (who were understandably featured in all the local news coverage). 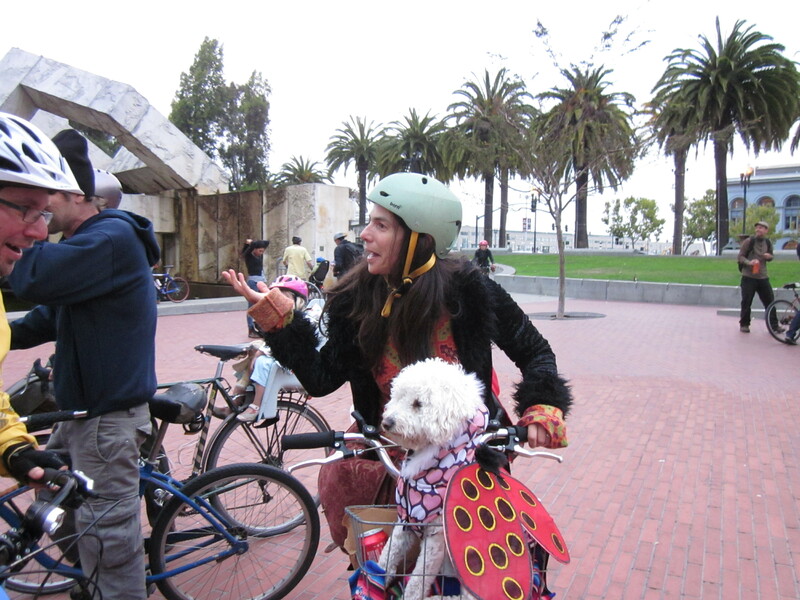 The families riding in San Francisco are absolutely fabulous. Mostly I hang with the Rosa Parks parent crew, so I sometimes forget how many more people are out there. This was a huge, huge ride, and as a result, there was about as much walking as there was riding. I was surprised at how philosophical many of the drivers caught in traffic were about the event. On some level, I suppose it is much like getting caught in traffic for any other event—game day, Occupy protest, whatever—just part of driving in the city. I am happy to have left this all far behind us. Yes, there is a flaming broomstick on the back of that bike. It’s something to consider now that Jerry Brown has vetoed the 3-foot passing rule. Although it was a new experience, and a slow ride, my daughter and I were having fun being around all the bikes, especially the unusual ones: tall bikes, conference bike, music bikes. We also saw a Yuba elMundo with two kids on board (not part of the Kidical Mass crew) stopped on the hill up Market Street because the motor had overheated. Unfortunately my son, who had spent the day running around for Undokai (Japanese Sports Day), was hungry, tired and frustrated and started crying and demanding to leave. We told him we would leave early and take him to a Mexican restaurant off the Wiggle on the way home, which improved his mood. The conference bike had a little kid in the middle (a bad shot I realize). And this is when the ride got funny. 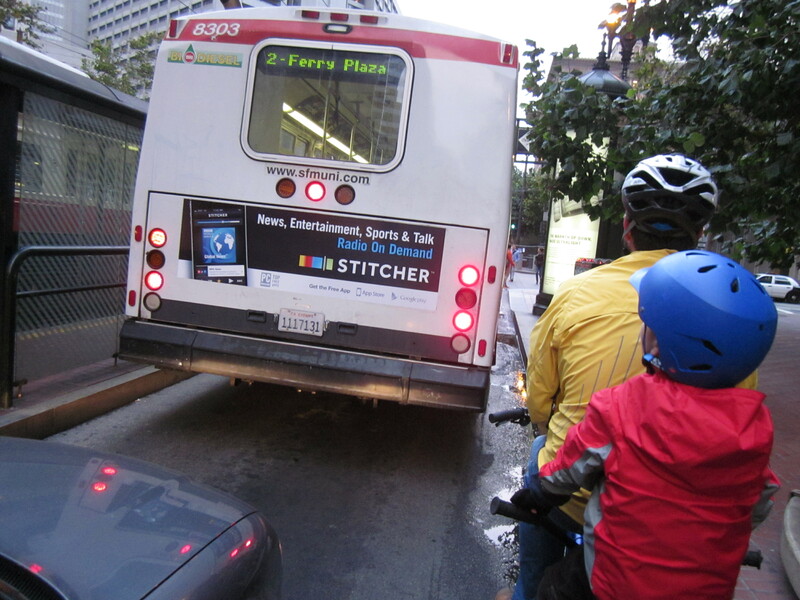 We peeled off from the main ride to the Market Street bike lanes heading west. “Where are all the bikes?” my daughter asked sadly. A few blocks later, the mass rushed into the lanes ahead of us. “Yay!” she said. We turned off from the ride and headed up another street. “Where are all the bikes?” A few minutes later, the mass rushed through the same street we turned onto. “Yay!” When we got onto the Wiggle, we rode for a few blocks on our own again, then whoosh! Critical Mass returned. We finally lost the ride for good when we headed directly up Page Street, which is far too steep for the fixie crew. When we got home, my daughter was still missing all the bikes, and wondering at bedtime when they would come back. At the rate our ride was going, I think she expected them to show up in her room. But stuffed as she was on avocados and fried plantains, she fell asleep before she found out. 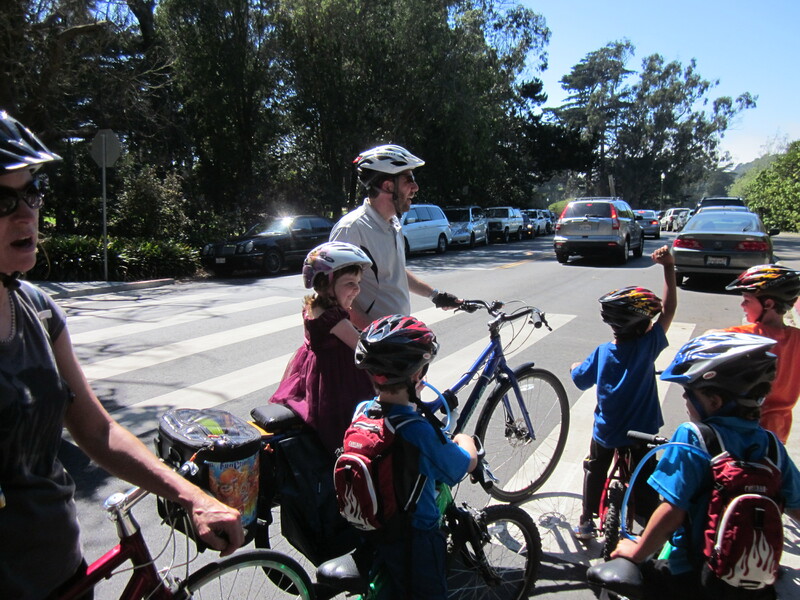 Our trip with the neighbors through Golden Gate Park seemed like a good potential Kidical Mass route. I would love to try another Kidical Mass ride, independent of other rides on a more child-friendly schedule. We had a lovely ride with some neighbors on Labor Day in Golden Gate Park, which started with the kids running around at Koret Playground. From there were headed through the closed streets to the food trucks on the Music Concourse for ice cream and onward from there down JFK Drive. For kids on their bikes, practicing on streets closed to cars is very nice. Matt suggested that a future ride go along JFK all the way to the Park Chalet at Ocean Beach, which despite its horrific service and indifferent food has extensive bike parking, a huge open yard and seating, and interesting woods behind the yard where kids can play and parents can practice their free-range parenting skills. Any interest? If so, perhaps one of these upcoming Sundays could be another Kidical Mass. I am so interested, but Sundays are usually no good for us because of church and other family things going on. Yeah, unfortunately the street closures are limited to Sundays until April. Could you make an afternoon (post-nap) ride? Depending on the day, we might be able to make it in the late afternoon (after 4:00). After April will the streets be closed on Saturdays too? Streets are closed Saturdays and Sundays from April to September. Sundays only from October to March (so far). Spring/summertime Saturdays, we are definitely in. I bet you’ll have a serious Kidical Mass group in place by then.